Assessing whether or not to spray soybean aphids? Soybean aphids in a field near Portage la Prairie photographed July 26, 2017. Photo: Chris McCallister, Red Beard Farms, Ltd. 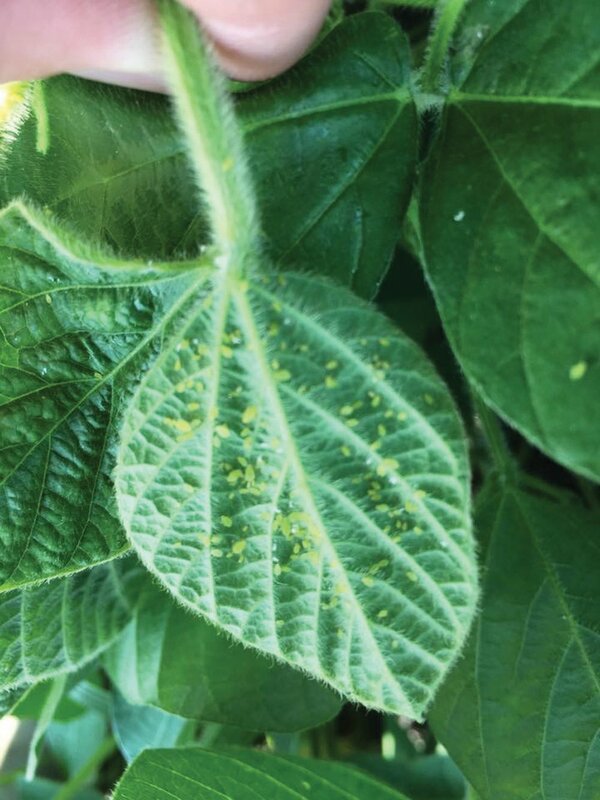 Soybean aphids can now be found in many Manitoba fields and farmers should be scouting for them, John Gavloski, Manitoba Agriculture’s extension entomologist, said in an interview July 27. 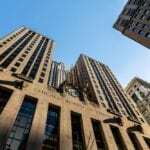 As of last week populations were generally well below the economic threshold, but some higher populations did exist, he said. 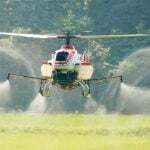 Some spraying was going on in the Portage la Prairie area, Red Beard Farms aerial applicator Chris McCallister said in an interview. The threshold for applying an insecticide to control soybean aphids is 250 and rising across 80 per cent of the field. The “rising” part is important, says Cassandra Tkachuk, production specialist with the Manitoba Pulse & Soybean Growers (MPSG). “I hope farmers aren’t spraying unnecessarily,” Tkachuk said in an interview. Economic injury to soybeans doesn’t occur until there are 670 soybean aphids per plant, she added. 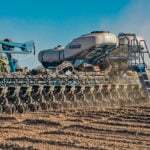 The 250-per-plant-and-rising threshold is meant to give farmers enough time to arrange to spray a field if necessary. 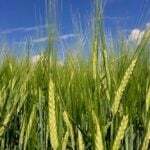 It’s recommended fields be assessed again after one or two days to see if populations are increasing. Soybean aphids in a field near Portage la Prairie photographed July 26, 2017.
photo: Chris McCallister, Red Beard Farms, Ltd. Soybean aphid numbers are growing in North Dakota and Manitoba, the MPSG July 28 Bean Report states. The report says farmers should assess aphids by going in a W pattern. Farmers should not only be scouting their soybean fields for aphids, but also beneficial insects. If present they can help control soybean aphids without applying an insecticide. Insecticide is an extra cost and will kill the beneficial insects. 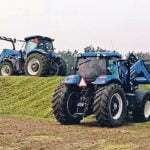 Tkachuk also urges farmers to contact local beekeepers who might wish to move nearby hives before a field is sprayed. There are many insects that prey on soybean aphids. The Aphid Advisor app available for iPhone, iPad and BlackBerry (www.aphidapp.com) can help farmers determine whether they should be spraying soybean aphids or not. Soybean aphids blow in from the United States, Gavloski said. He spotted some in early July, which is normally when they show up. 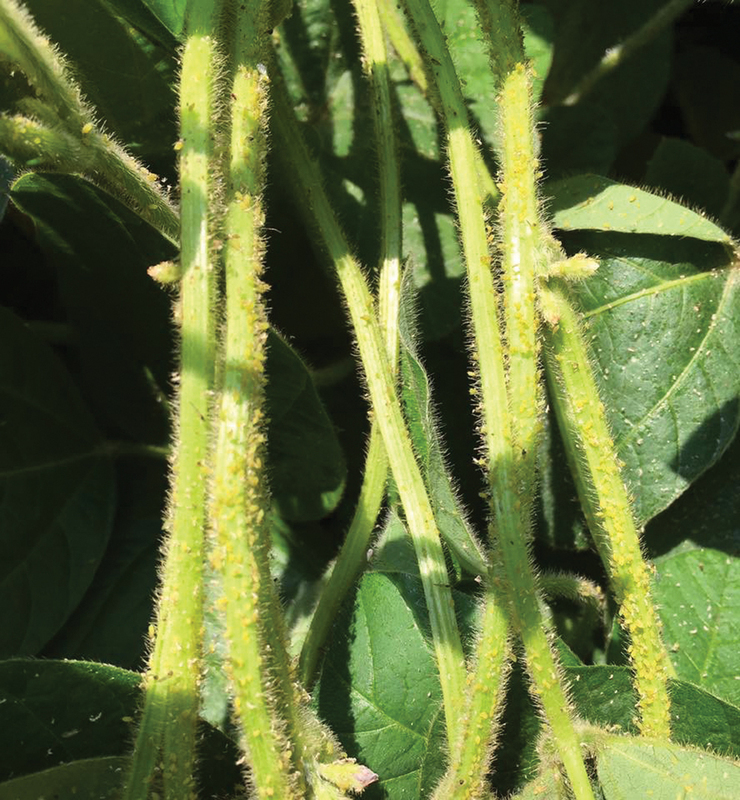 The Bean Report says according to a North Dakota State University publication some soybean aphids are suspected of being resistant to pyrethroid insecticides, such as Lambda-cyhalothrin and Matador-Silencer 120EC. Farmers should take note of any insecticide failures. Get more information on scouting for soybean aphids, including a visual guide on the University of Minnesota Extension website. 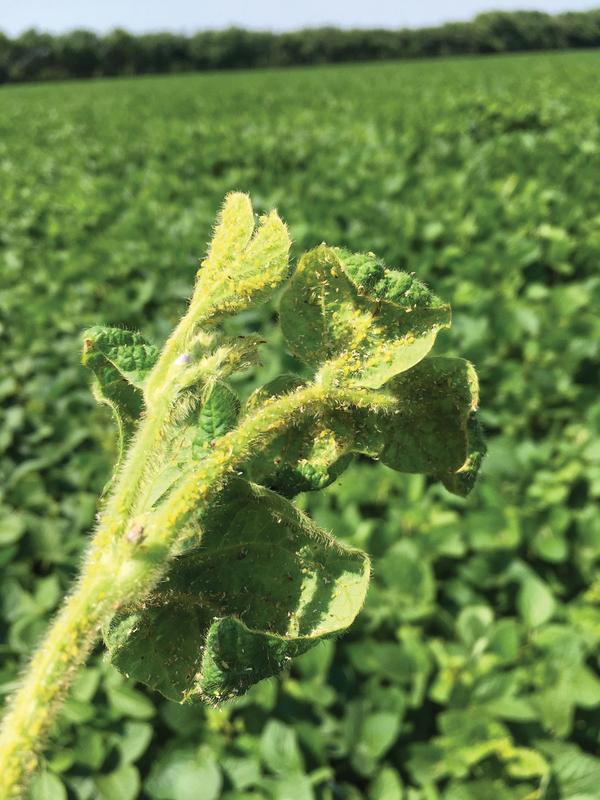 Manitoba Agriculture Pulse specialist Dennis Lange has seen soybean aphids in different parts of the province this season and echoed Tkachuk on not spraying unnecessarily. 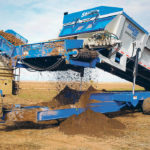 A version of this story first appeared on AGCanada.com.